Our company can produce wireline (Q series) core barrels, T2-101LTK60 core barrels, and we can supply various foreign standards of core barrel spare parts, such as core lifters, core lifter cases locking couplings etc. 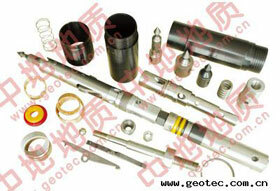 Wire-line core drilling tools can lift core from drill rods without picking up coring system. A complete set of wire-line drill tools include: core barrel assembly, overshot assembly, drill rods, holding dog, hoisting plug, circle wrench etc. It has some advantages such as high penetration rate, high core recovery ratio, long bit life and lower labour intensity, the advantages can get more clear with the increasing of drilling hole depth. We are a professional core barrel manufacturer and supplier in China. We have gained the recognition of a large number of clients through our 20 years' production experience and marketing and serving experience, and meanwhile we have accumulated abundant experience in terms of products. At the same time, we keep researching core barrels that can better meet the clients' needs and the market. Our core barrels have been exported to South America, Africa, East Europe, Southeast Asia, and Middle East. We have clients in America, United Kingdom, France, Canada, Australia, New Zealand, Philippines, Indonesia, India, Chile, Brazil, Russia, Algeria, Morocco, Malaysia, Thailand, Pakistan, Mongolia etc. Located in Wuxi, near Shanghai, the biggest port city of China, we are provided with convenient transportations of any kind, by land, sea or air, which will greatly reduce your transportation cost. To meet the clients' different demands, we can provide all kinds of geological drilling tools, such as diamond core bits (synthetic natural), reaming shells PDC bits, core barrels overshot, drill rods. If you need them, please contact us.